South Africa seeks highly skilled individuals to live and work in SA. SA Migration Services will provide professional assistance to arrange your work visa for you if you qualify. Work Visas are regulated in terms of Section 19, Regulation 18 and items 18 (1), 19(2), 20, 21 and 22, of Schedule A. Under the General Work Visa there are very strict requirements. The South African government, although trying to promote work and trade in South Africa, recognize the need to give South Africans the chance to obtain employment ahead of any foreigner. You will have to prove that you are the only person who can fill that position and that no other South African can play that role. This is done by placing an advert in a national newspaper advertising the position. A Department of Labour report would need to be obtained. You will also need to have a job offer/contract from your future employer. The most important part of the process is skills assessment by SAQA (South African Qualifications Authority) in SA which evaluates your formal qualifications and compares them to a SA qualification. This process is mandatory and for this we would need your academic transcripts and award diplomas. Note under the regulations provision is made for the recognition of work experience in the absence of formal qualifications and this therefore makes provision recognition of prior work experience (RPL). This is a paper based system which merely compares the foreign qualifications and arrives at an equivalent qualification in SA, and if qualified in SA then no SAQA needed. Next your employer has to prove that you are the only person that can fill the position and no other South African can fill that role. This is done by placing an advert in a national newspaper advertising the position. 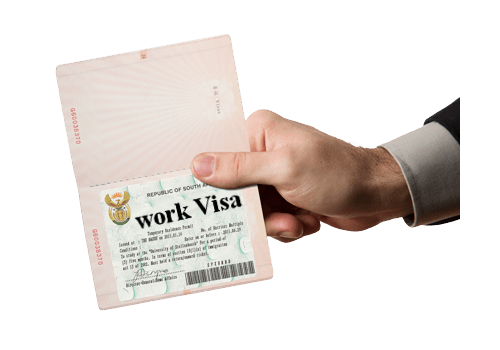 Please note the work Visa is issued in the name of the employer so the person is tied to the employer. If they change the job they will require a new work Visa. There is some good news for people who are qualified through work experience only and they can qualify if they don’t require formal qualifications, ie SAQA. An intra-company transfer work Visa may be issued by the Department to a foreigner who is employed abroad by a business operating in the Republic in a branch, subsidiary or affiliate relationship and who by reason of his or her employment is required to conduct work in the Republic. An important factor is that the applicant has to have been employed with the company abroad for a period of not less than 6 months. This Visa does not require the hassle of proving the company could not find suitable applicants and it does not require the hassle of verifying an applicant’s formal qualifications. It is based purely on employment. If you are a company that needs to transfer in foreign employers, please contact us and we will make this go as smoothly as possible. It is important to note that this category of work Visa cannot be granted for more than four (4) years and this type of Visa is not extendable. The Critical Skills Visa South Africa is for skilled workers whose occupation is on the Critical Skills Visa List for South Africa. This list reflects the occupations that are in demand in South Africa. The newly published "Skills or qualifications determined to be critical for the Republic of South Africa in relation to an application for a Critical Skills Visa or Permanent Residence Visa"
This category of work visa may be issued to an applicant who falls within a specific professional category or specific occupational class determined by the Minister by notice in the Government Gazette. This is done after consultation with the Minister of Labour and the Minister of Trade and Industry. If an applicant falls within one of the professional categories listed on the critical skills list and also has the appropriate post qualification working experience in that profession then such applicant may qualify to apply for this category of work Visa. The applicant also needs to where applicable register with the relevant South African professional accreditation body regulating that industry as stipulated by Minister of Home Affairs. Such body must also confirm the applicant’s skills, qualifications and working experience. Furthermore, such applicant’s qualifications need to be evaluated relevant to a South African level. An applicant for a Critical Skills Visa may enter South Africa on such visa without having secured a job offer first. It is, however, required of the applicant to confirm employment with the Department of Home Affairs within a period of one (1) year upon arrival in South Africa, failing which, the Visa would automatically lapse. The Critical Skills Work Visa is tied to an individual and not to an employer so under this Visa a person can leave from one employer to the next without obtaining a new work Visa. Fill out the enquiry form on the right, to give us more information on your current status. Once we have all your information, we can assess whether or not you will qualify for the requested visa.